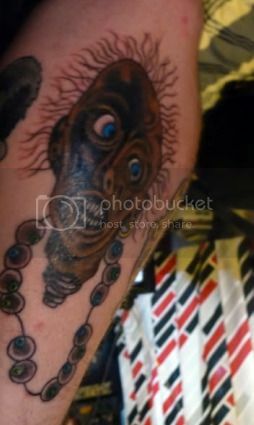 But then I asked myself: has anyone ever gotten laid thanks to a Monkey Island tattoo? Not unless “Guybrush Threepwood” means “I have lots of money and stamina, and I want to spend them both extravagantly on you” in French or something. 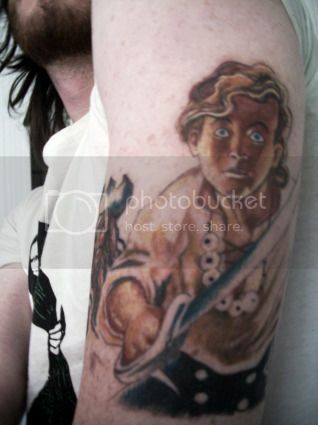 Well, what a well-executed tattoo in a perfectly good likeness of Guybrush Threepwood… a cartoon man who looks a lot like a lady. 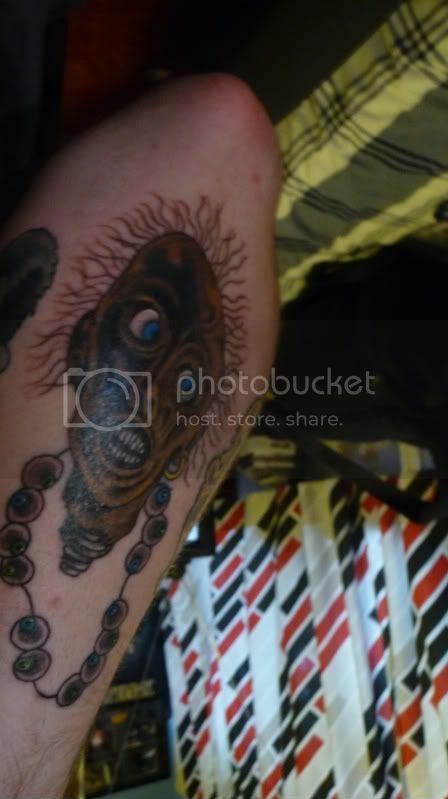 This Murray the Evil Talking Skull tattoo violates some pretty basic rules of tattooing. 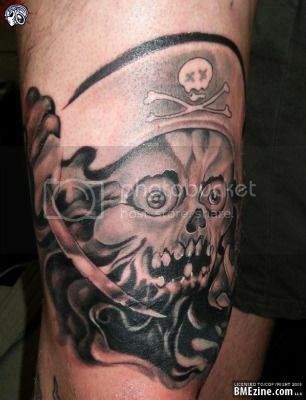 For example, every skull tattoo requires a backdrop of either flames or crossbones. Oh, and also? 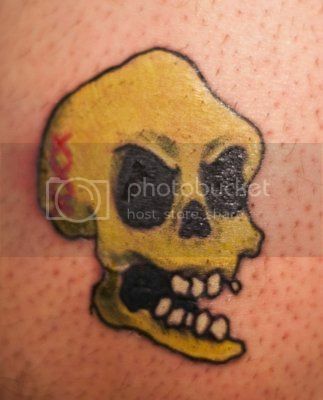 Don’t give your skull tattoo gangrene. Excellent tattoo, but the dude attached to this appendage is going to need a placement agency to find him a gang that favors murderous video game ghost pirates. Not sure what else you can do with ink like this. You know… aside from being the toughest-looking nerd at a get-together of really-not-tough-looking nerdy-types with a horrible sense of social mores. Sally can’t wait to tell her Mom all about her new beau and his tattoo of a roughly-decapitated, shriveled head with an eyeball necklace. Even more so? She can’t wait to see that tattoo whenever she and her fella are trying to get in the mood. Aces! Oh, really? 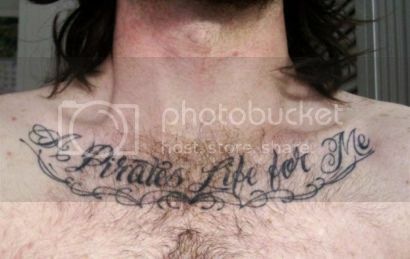 Pretty committed to the pirate’s life, are you? Peg leg? Parrot? Scurvy? I assume you’ll be sticking with “unkempt hair, poor judgment, and reeking of grog” for now. As always, yor commentary makes tattoos with somewhat questionable concept hilariously funny! I am somewhat embarrassed that I did actually play this game. Huh. And that committed pirate appears to have been avoiding the sun for quite a while somehow. Maybe it’s because I never played the game, but what an obscure title to permanently ink yourself for! Think how often you’d have to explain just what the hell your tattoo represents. i love the ghost pirate tattoo. its really unique. “Obscure”? Seriously? Only the Guitar Hero/Halo kiddies of the today don’t know what Monkey Island is. Personally (and as a woman who happens to love Monkey Island!) I find these a lot more attractive than the usual boring tattoos men would get to seem cool or tough.